Another stop at Home Depot this morning. I’m now at the point where I can pick up some wood and sawhorses this weekend and get started. I ordered the Retro Mame Marquee (third one down). With the Lexan sandwich. Since the Home Depot Lexan is 3/32″ rather than 1/8″, I decided I can’t use it. I need to make the control panel from 1/8″ Lexan and 5/8″ MDF/Ply, so that the 3/4″ t-molding will fit properly. So what I’m going to do is get going with building the rest of it, and order the Lexan for the control panel from somewhere like Professional Plastics when I have the CP size finalised. I’ll need to make sure I put the wood the right way up since the t-molding slot won’t be symmetric, and my plan is to clamp the polycarbonate and wood together and drill them as a sandwich to ensure alignment. I have also discovered that Home Depot stocks Lexan, which will save me having to order online and pay shipping etc. Unfortunately my spacious control panel design means that 18″x24″ is a bit small one way. I have to bump to the next size, i.e. 48″x24″. More expensive, but I can probably get a marquee sandwich out of that size as well as a CP cover. I also have a 1/16″ slot cutting bit on the way. The router bit set does not include one; however, it does include a flush cutter. Enjoy the longest (or shortest, depending on your hemisphere) day. The project progresses. I’m working from arcadecab.com as my main source for information. …which I think is reasonable. 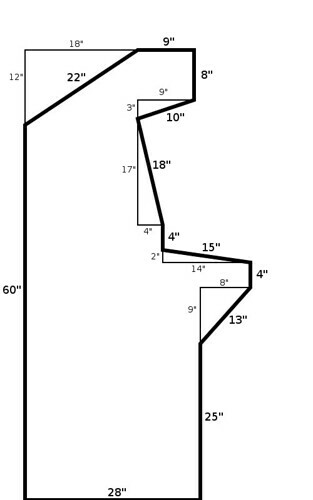 (Dimensions of the angled sections are rounded up to the nearest inch). This will give me a cabinet that is 3 feet deep at its deepest point, 6 feet tall, and I’m thinking 28″ for the width – which would give it a square base. The control panel has a slight rake, and is 39″ off the floor, which puts it comfortably at about my belt height. This plan also reveals that I’ll need at least 32′ of t-molding (to fit along all top and front edges of both sides, and also on the front of the control panel, the top and speaker panels, and the top of the display base). I plan to install a hinge at the joint of the 25″ and 13″ sections to allow the angled section to fold down and reveal the keyboard/mouse tray. Score one for Ubuntu. Plug in scanner, fire up xsane, everything&apos;s happy. Recently I joined a mailgroup at work called “Stuff” designed for off-topic dicussions and want-ads. Today I got a couple of great deals. First, a 2.1 speaker set for $10. The seller said they didn&apos;t work the last time he tried them. They didn&apos;t work for me at first. So I checked them independently and found the tweeters worked. So that was something. But the subwoofer didn&apos;t. I unscrewed it and poked around. Nothing really to see – the speaker itself seemed fine, while the input/amp section was sealed. Then I noticed that the input said “12V” and the power supply said “Output: 30V”. So when I got home, I dug around in the basement and found a 12V supply with a plug that fitted. Everything worked just fine. Result! Second, the same person was selling a HP Scanjet 6200C, sans drivers and leads. After a quick check, I said I&apos;d have it for $10. The scanner part of my printerily-challenged all-in-one technically still works, but is too bulky to keep on my desk, so the 6200C will make a good replacement scanner for general use. I got a digital photo frame for my birthday. I&apos;ll be putting it on my desk at work. I&apos;ve loaded it up with 12 photos so far. It&apos;s a bit of work resizing and cropping to 720×480, but it&apos;s a great thing to have! I’ve just been reading an interesting paper on teaching programming. First, the data regarding rates of attrition on computing courses is startling. Between 30% and 60% of the total CS intake fails the very first programming course! Surely one would think that the first of these is no hurdle at all (the concepts are part of everyone’s everyday life) and yet it is! From personal experience, I would say actually that recursion is quite a significant mental way past iteration, and I think many programmers never get that far, let alone to the hurdle of concurrency. Of these, only the first group succeeds as programmers. The other two flounder. You are currently browsing the Why is a raven like a writing desk? weblog archives for June, 2007.